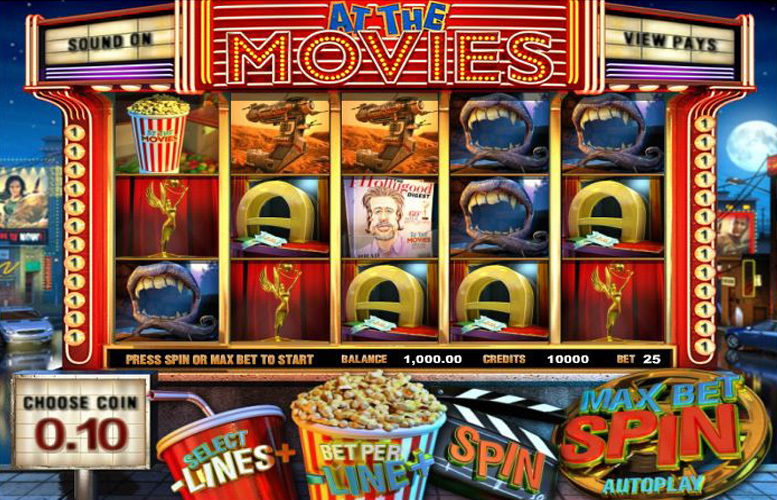 At the Movies is a typically strong looking offering from a designer known for their visually appealing slot machines – BetSoft. The game’s symbols and background are brightly coloured whilst the music makes for a slot with a fun feel. However, the title does suffer a lack a depth. There aren’t much in the way of exciting bonuses and the low betting limits might put some players off. All that said, for a title from BetSoft, the main game prizes are decent enough. This may appeal to some players and negate the At the Movies’s many flaws. Visually strong. The brightly coloured gameboard and well-illustrated symbols make At the Movies look the part. High main game jackpots. BetSoft games rarely feature four-figure jackpots. The highest pay-out on At the Movies is an impressive 5,000x the line bet. Not much under the hood. The game suffers a lack of innovative features. It seemingly relies on looks alone which isn’t enough in 2017. Low upper betting limits. Unfortunately, this affects most BetSoft games and At the Movies is no exception. Award statue = 5,000x line bet. Popcorn = 2,500x the line bet. Movie poster = 1,000x the line bet. At the max line bet the top jackpot is 25,000 coins. The tragedy and comedy mask symbol is the game’s “wild”. The masks will substitute for all symbols except the projector “scatter” icon. What’s more, any wins that use the masks as part of their combination will be instantly doubled! Landing three or more projector “scatter” symbols anywhere on the reels will trigger the game’s free spin mode. The more “scatter” symbols landed, the more spins are awarded. Three, four, and five will pay 8, 12, and 20 free spins respectively. In addition, any wins during this free spin game will be automatically doubled. Not bad! Ace = 500x the line bet. King = 400x the line bet. Queen = 300x the line bet. Jack = 200x the line bet. 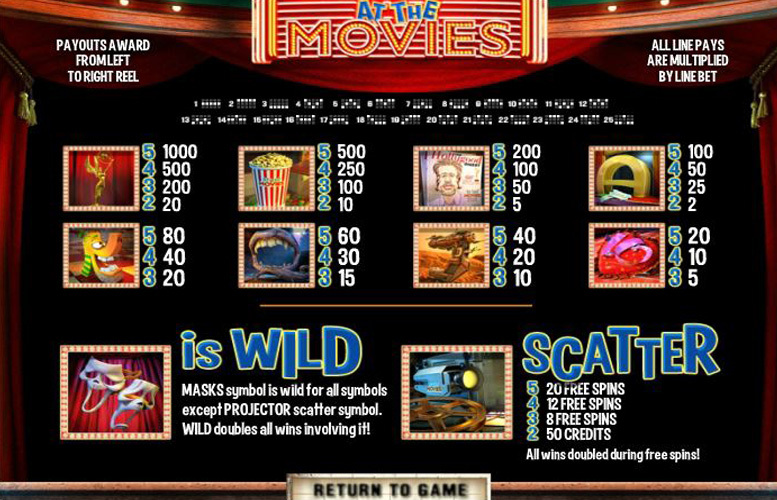 Players are given total control over how they spread their money across the reels in At the Movies. They can adjust the number of win lines between one and 25, as well as the number of coins bet upon each one. Here, the lowest is just one, and the highest is five. In addition, the can change the value of each coin too. The values range from 2p to 50p. Therefore, the lowest possible bet per spin is just 2p. Meanwhile, the maximum is £125. Whilst this will certainly satisfy most bankrolls, those wanting to bet huge on every spin of a machine will likely find this upper betting limit too low. Despite its strong looks At the Movies is a bit of a basic machine. The features are rather standard, and there isn’t a great deal to keep players engaged. What’s more, being a BetSoft machine, the maximum bet per spin is very low. This probably won’t matter to most players. However, the highest rollers around will surely find £125 on the low side. One redeeming factor on At the Movies is the fact that it does offer some decent top jackpots. Even then, they’re not amazing. It’s a game that relies too heavily on its strong visually presentation, neglecting gameplay features. It’s very difficult to imagine this one being anyone’s favourite machine ever.